Engage your workforce through interactive and immersive training and keep them engaged and the safety topic alive. Individual and company-wide reports to help you make informed decisions and minimise risk. 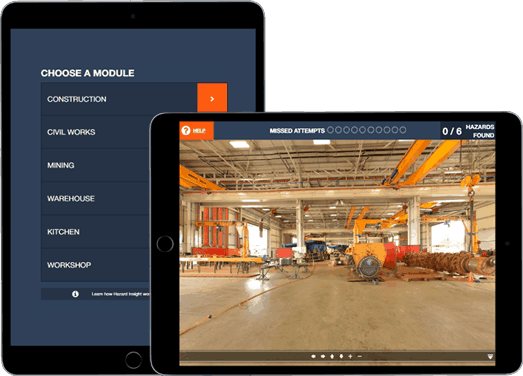 Increase compliance and complement your safety induction program with our immersive workplace training solution. Hazard perception is critical for reducing injuries in a preventative manner. Risk blindness and induction deafness are causes of increased safety risk. Tap Into Safety improves hazard perception by immersing the worker in their environment, and guiding them through a hazard spotting game. The Tap Into Safety platform provides reporting analytics that show the safety knowledge of your employees. Use to trend and predict employees at risk and to help make informed decisions to improve operations and processes. Address your key concerns with custom built content developed in your work areas. Our prebuilt modules are ready for immediate deployment and built to best practice for proven results. Custom options are fully tailored to your organisation’s needs.